I have come across a very useful resource at Australia's Bureau of Meteorology. If you go looking at station data (like this), there is a link to "Additional site information", and then to a "basic site summary". And tyhis has all sorts of metadata, including history of measurements taken, detailed maps of the site, including a skyline diagram, and a history of instrument changes. It is very useful in the context of the arguments about places like Amberley and Rutherglen. But it is a bit awkward to access through this chain of links. So I have added it to the portals page. This has a row of buttons at the top that you can use for different data sets, and I have added one for "BoM Metadata". It brings up page arranged by states; it is the same set and format as for the ASN part of the GHCNDaily page. When you ask for the state (WA shows initially), it shows a list of Place names and links. The link leads to the metadata for that place, in a separate tab. Many of the stations don't have temperature data at all. Generally those that do will be marked by dates for the duration of the record, so look out for these. I don't guarantee that you will find useful information for any link, or even any information at all. But the main stations have good information. Try it! I'll place a copy blow the jump. ERSST V4 is the sea surface temperature data I use in TempLS. It comes out on about the 3rd of each month, earlier than land data. I have long been thinking about integrating it separately to make a SST index. I do calculate SST separately as part of the breakdown of TempLS. But that is part of a global mesh, and the land boundaries are fuzzy. Also there are issues of treatment of sea ice which need further development. ERSST is published by NOAA as a monthly set of temperatures on a 2° square lat/lon grid, starting centered at (88S, 0E). Land grids are marked as NA, but sea ice is set to -1.8°C (freezing point of sea water), which is an ongoing problem. NOAA itself published global ocean temperatures about 2 weeks after release of ERSST, so my index should match that. The initial data may be modified somewhat by the time of the NOAA calc, although this shouldn't make a big change. So this pushes me into the world of land and sea ice masking. I haven't used this in TempLS, mainly because the poor coverage of polar and Africa/S America regions dwarfs the boundary irregularity. There are instances of sea areas represented by land data and vice versa, but they tend to average out. And also masking does not work well with my preferred method of triangular mesh. I have been maintaining a plot I did in February, comparing the temperatures month by month of various indices with those of 1997/98. I thought I should post the plot again here for easier access. There is some sign of recession from the peak in April, and this will probably be reinforced in May, although global SST still seems warm. In fact, I had to modify the plot somewhat, as in April for the first time, some indices (RSS and UAH, troposphere) dropped below their 1998 levels. This was because of an unusual TLT spike in 1998, where April stood out as hottest month. I have made the bars somewhat transparent. Below the jump I'll show the NOAA plot, to show the April result (1.103°C, down from 1.23). I'll also mention Arctic Ice and news on my battles with HTTPS. My precvious post on HTTPS and how it affects blogs, including Moyhu, was one recording my hesitant process to just allow https links to this blog. But things are moving fast; Sou noted that Blogger had already made my decision redundant by making it the default. She linked to this notice, which also mentions that I could opt in to HTTPS redirect. I see that at at WUWT, there is annoyance at the effects that it has caused when Wordpress made redirect compulsory. I think this may be coming to Blogger. I've taken this as a call to reorganize various other aspects of the blog to facilitate the implementation of https. I'll describe what is happening there - it should be seamless, but I ought to explain in advance in case of glitches. HTTPS seems to be coming to blogs. Most Wordpress sites have converted. Google is a big promoter. I think it is only a matter of time before Blogger sites come under pressure, though at the moment, that system is dragging its feet. So I have enabled HTTPS for Moyhu, and I'm writing about what it may mean for you. At present the likely answer is - nothing. Personally, HTTPS seems to me to offer little and to have downsides. My enabling it does not require anyone to change the normal http: URL they use, and with no action they will see the usual response. If you use a https: URL (nothing else need change), then everything that appears on the page has to have a certificate. Since a great deal of stuff that has been linked in the past does not have that, unless I update the links, it won't appear. Worse, you may get a scary message saying that something has presented an invalid certificate, and someone may be trying to do you harm. Hopefully this won't happen, but if it does you'll know where it is likely coming from, and it is not a threat. I've been watching the situation at Wordpress blogs, and did some commenting at this thread (scroll up for more). Wordpress has somehow made https mandatory. That is, whether you link with a http or https url, it is treated as https. To solve the problem of all the old images etc that don't supply certificates, they make their own cached copies with https url. The problem there is with locations that update content; the cached image doesn't change. Worse, the system intercepts links to such locations, and directs to whatever cache they have. You could find that you don't see what you thought you were linking to, but a copy that someone may have made on even a different WP site months ago. Moyhu won't have that problem (as yet), because Blogger doesn't switch URLs, and also doesn't cache. So I will use entirely http links to past posts, and you should too. Again if you don't you'll see missing images, and maybe a scary message. For the moment I'm planning to restrict HTTPS linking to the home page and probably some heavily used pages like latest data and trend view. 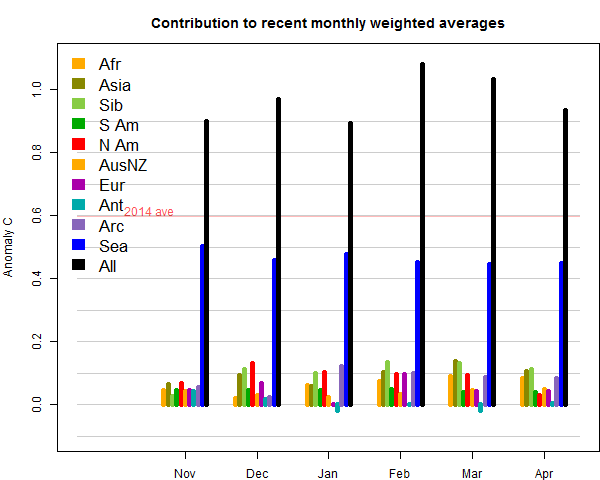 April GISS down 0.18°C - hottest April in record. In fact, GISS first exceeded 1°C in October 2015, so until then everything over 1°C is a monthly record. October was 1.07, so April is getting back to that. GISS 2016 went from 1.29°C in March to 1.11°C in April. The drop in GISS was higher than other indicators; TempLS mesh was down 0.075°C (China increased it); NCEP/NCAR down 0.15°C. For the lower troposphere, RSS was down about 0.09°C, UAH down 0.02°C. The Arctic was cooler, and GISS is sensitive to that. Other regional changes were much as discussed in the TempLS post. As usual, I'll show the GISS map and the corresponding TempLS below the fold. In other news, Arctic Sea Ice is still melting fast..
TempLS mesh, reported here (as of 8 May, 4263 stations, China still to arrive), was down from 1.032°C in March to 0.928 in April (base 1961-90). This is slightly smaller drop than the NCEP/NCAR index (0.15), but larger than the satellite reductions(UAH 0.02; RSS 0.09). TempLS grid dropped by more (0.136°C), which is similar to NCEP/NCAR. Again unusually warm in Russia and W North America (except Labrador strait region). Not so warm in Arctic, cold over Hudson's Bay. In the attributions plot, the main point of interest is that SST has risen again. The land pattern is similar to recent, but more subdued. In other news, JAXA Arctic Sea Ice shows continued melting and record low levels; since mid April the margin between it and previous years has become quite marked. 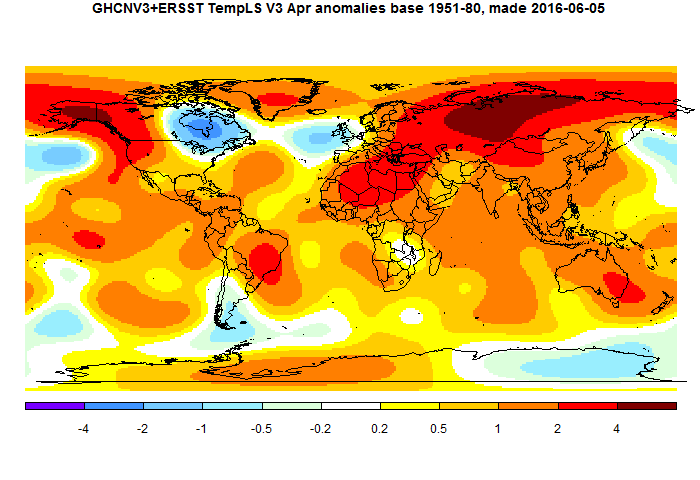 The NCEP/NCAR index that I calculate from their reanalysis was down by 0.147°C in April, from 0.783°C to 0.636 (anomaly base 1994-2013). That is then down 0.2°C from February, and coolest for 2016, but it still warmer than any month before 2016. Temperatures have been stable near that average level since about March 10, after some very high earlier peaks. There was this time less warmth in the Arctic (except Greenland), but a broad band of warmth through Siberia, Eastern Europe, into Africa. Cold in NE Canada; patchy in Antarctica. Among other reports, Karsten has GFS surface down from 0.794°C to 0.706°C. Roy Spencer has UAH 6 lower troposphere down slightly, from 0.73 to 0.71°C. ENSO numbers are down, and if you watch the ENSO movie of recent weeks, you can see the equatorial jet turning to cool.